About time I added another post here! As you can no doubt tell from the dodgy pun of the title (sorry! 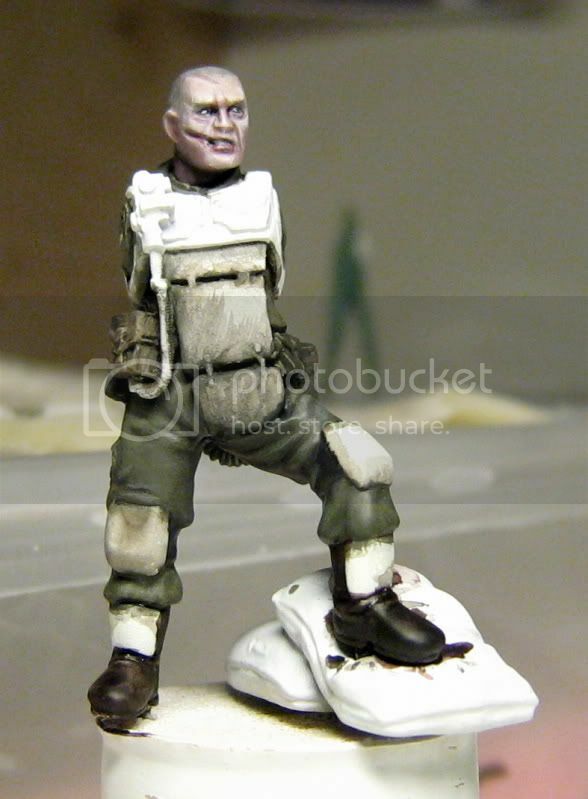 ), this post is concerned with the method I use to paint human flesh. I've received a lot of questions on forums lately asking me about the recipe's and methods I use to paint flesh (specifically caucasian flesh), so I thought rather than reply every time with the same response, I would put together a short (text heavy for the time being - not had a chance to do step by step pics yet) tutorial. With any painting project, it is always worth doing some good preparation to ensure that you don't make any mistakes etc that you would have to correct later, or that could frustrate you/ruin the look of the finished figure. The first thing worth doing when painting flesh is to look at reference pictures. Skin tone's vary from person to person, regions and climates. The picture below is a perfect example of this - notice that even among caucasian people, the tones can be quite different. 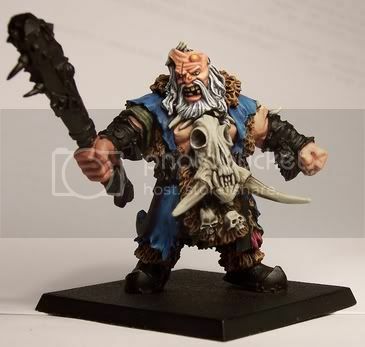 While most paint manufacturors make "flesh" colours, and these can be good for painting armies in a quick fashion, often they are quite orangey, or pinkish in appearance, leading to an un-natural looking figure (for example the skin on my old ogre hunter below (2004), while nice enough, doesn't look very realistically human). Therefore, for my current method of painting flesh, I like to look to other, more realistic looking tones for skin. My current colour of choice as a base for all caucasian flesh is Games Workshop's Dheneb Stone paint from their foundation range. A nice "off-tan" colour, it also has the added benefits of great coverage, thins well and takes paint and washes over it very well. The colours used for shading flesh go a long way to helping define the mood, character and overall look of your finished figure. Greener shades can be used to create sickly looking characters, while red and pink shades can help define a healthy, "softer" looking character. 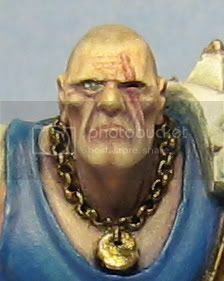 While the shades I use for painting flesh are dependent upon the figure for the reasons outlined above, most commonly I use a mix of Vallejo Warlock Purple from their Game Colour range, and Charadon Granite, again from Games Workshop's foundation range, along with a little Dheneb Stone mixed in. The figure in the picture below has had the above mix applied over a Dheneb Stone base. Beyond simply shading the flesh on your figure, it's also a good idea to add some toning in order to add a bit more interest to the skin. On the Cadian stormtrooper I'm working on at the moment for example (pictured at the start of this post), I have added some toning to the face using a mix of Baal Red and Devlan Mud washes from Games Workshop mixed with a little Vallejo Matt Medium (to remove the shine). The reason for this is that the figure will be set in a winter scene and I wanted a cold look to the face, hence the pink cheeks. While this isn't an immediately noticeable effect that can be picked out on it's own, it adds considerably to the overall appearance of the mini. On Griff Oberwald's face (below) for example, toning was applied using a darker purpleish tone to make him appear aged. For highlights, as always it is simply a case of lightening the base colour. In this case, Dheneb Stone is first re-applied in a few thin coats to build a base for the highlights. Following this, P3 Menoth White is added to Dheneb Stone in increasing quantities for a few stages of highlighting. There is no definitive placements for highlights as it very much depends upon the figure, look you are aiming for etc, however as a general rule, the areas to focus upon are the brow, tip of the nose, tops of the cheeks and the tip of the chin. In order to replicate the translucent qualities of real human skin, the shades and highlights are best applied in very thin layers. Thin the paint until it is almost was like in consistency, get some on your brush, then dab the side of the brush lightly against a tissue a few times until most of the moisture is removed and then apply. Hopefully that covers the main thrust of how I approach painting flesh. As with anything, there are many approaches that can be taken, this is the one that works for me, but you might find something else more suitable to your own style. Above all, don't be afraid to experiment with colours, tones and techniques to get the effect you desire. Would love to hear your comments on your own experimentation and techniques for painting flesh. Brilliant stuff Dante it's great to see this up any running! Thanks chaps, comments much appreciated! Sounds advice across the board here. I haven't done much flesh in the past year now thanks to painting a ton of Space Marines, but the few I have done have been their own flesh recipes. That is to say, not using a recipe! I've found that getting away from the flesh colors was one of the most liberating realizations some time back. I highly suggest more folks do so. Your flesh tones will thank you ^_-. Consider this shared on TPC's facebook ^_^. I've just started painting the skin on my DE wyches, and I've found I'm enjoying it more than I thought I would. I also use a lot of dheneb stone in mine, partially because I was doing everything I could to avoid pink toned colours to emphasis that while these eldar were pale, they were also not human. 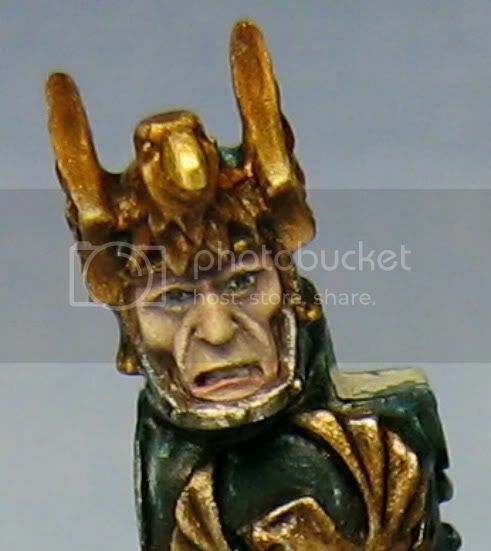 Although I cheat and use devlan mud to shade and only do five layers, but these are '20 strong and most of it skin' units, not Golden Demon entries. I've actually found that more alien skin tones are both easier and more enjoyable to paint. And that caucasian is one of the hardest of all. Maybe it's because we see so much of it and can pick out the flaws? Thanks for the comments guys, exactly the kind of discussion I was looking for! @ Grey Death - I hear that! Part of the fun is just winging it and making up as you go. It's normally how you find great new recipies. @ Morgrim - Absolutely, painting flesh is one of the most fun things I find. Playing with tones can be a great way of getting alien looking flesh. I found this post through a link on dakka. great tutorial :) any thoughts on how you'd go about doing black, onyx-like skin (e.g., salamanders space marines)? For such dark skin, I would go with a very dark blue with a little grey mixed in (grey/black on their own are too lifeless for skin) as the base. Shade by mixing in black and maybe some red glazes. 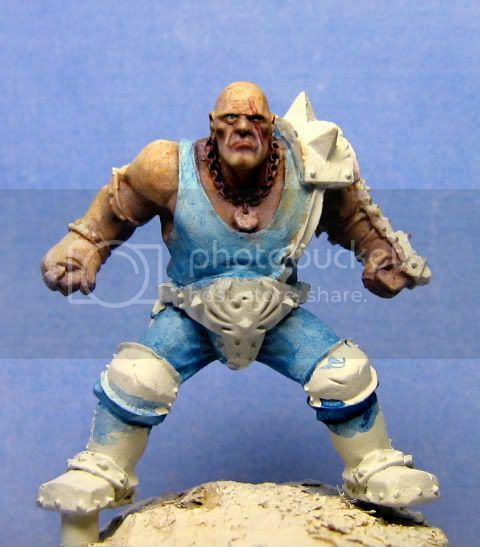 Highlight by adding bleached bone or white then tone things back together with some glazes/ washes of black or other contrast colours (red contrasts blue well). Ultimately, onyx black skin is going to be difficult to make look natural and I think the eyes will also be an important part in getting it too look correct. wow... those are colors I would have never thought of :) for the dark blue I've got GW's necron abyss. for the gray mixer, am I wanting something light like fortress gray or more midtone like codex? on that note, how much gray are we talking? 4:1 blue to gray? I have access to badabb black and baal red washes for shading. would the order of application matter (i.e., black before red or red before black)? 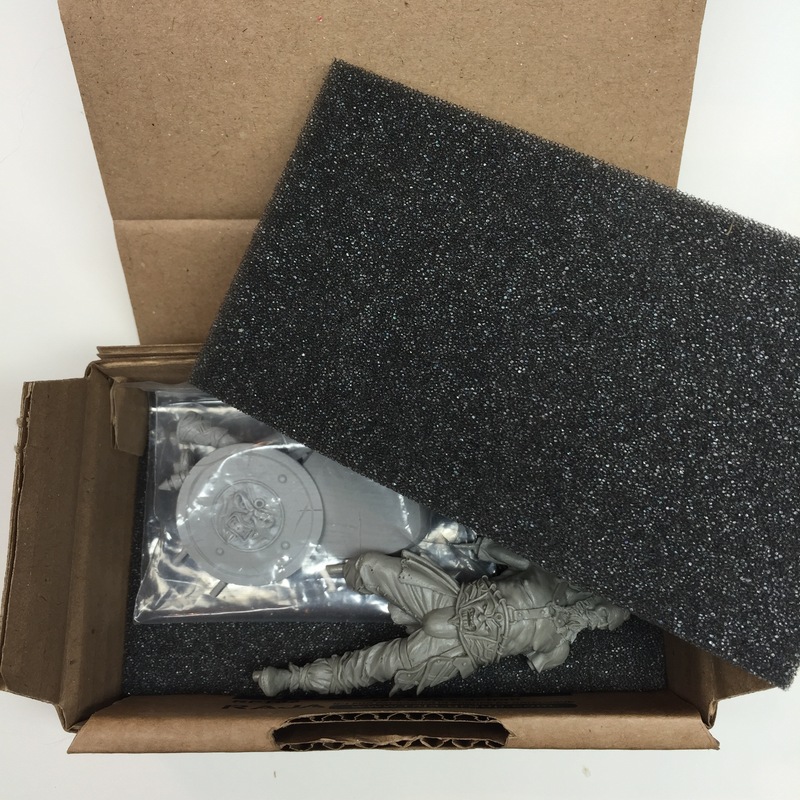 can't wait to give this a whirl when I unbox my next batch of marines!